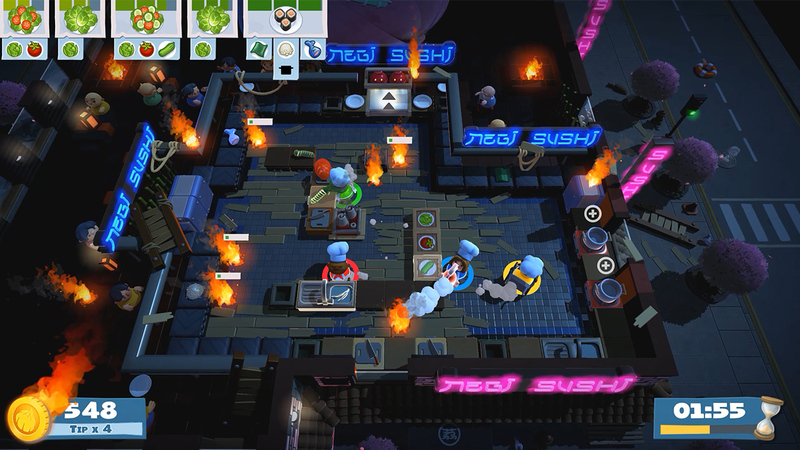 During Nintendo’s E3 2018 Direct conference they announced Overcooked 2, featuring changing kitchens, local, wireless co-op, and online in new kitchen environments. Players can now throw ingredients instead of walking them across the kitchen as they bake, broil and barbecue. Overcooked 2 is coming to Nintendo Switch on August 7, 2018. Stay current with the games coming out this year with the video game release date 2018 guide. Hope they all hit at the same time. how do you make a sequel to that game... i dont quite get it. i guess more puzzles to the game play? Hopefully less gimmic levels. The fun in that game is the coordination between people and the constant incoming orders. The gimmic levels--fire ball! Move the kitchen around!-- were lame. Yeah that was okay, there was one hot lava one with fireballs towards the end that we all just gave up on. Bad enough the controls were kinda janky. I hope they fix that in 2. Its still super fun coop. The first one is one of the finest couch co-op games ever. Online mode is a blessing.